It is not every day that a new vertebrate is described from Europe. In a new paper published in Journal of Zoological Systematics and Evolutionary Research, Samuele Ghielmi and Michele Menegon (MUSE - Museo delle Scienze, Trento), Lorenzo Laddaga (Museo di Scienze, Domodossola), Sylvain Ursenbacher (University of Basel) and Stu talk about the ‘discovery’, morphology, genetics and conservation of Vipera walser, a new viper species from the north-western Italian Alps. In 2005, Samuele Ghielmi noticed something odd about adders and lizards in the north-western Italian Alps. First, there was a population of European Adder Vipera berus in the area that was disjunct from V. berus populations in the rest of Europe. More intriguing was that within this area, the Common Lizard Zootoca vivipara, one of the adder’s main prey items over much of its European range, was replaced by Zootoca carniolica, its ancestral oviparous (egg-laying) sister species. This observation sparked a morphological and genetic study which led to the naming of Vipera walser. The beast - variation in individuals of Vipera walser sp. nov. Adult males (left) and adult females (right). The new species is remarkably distinct genetically from both V. berus and other vipers occurring in western Europe. 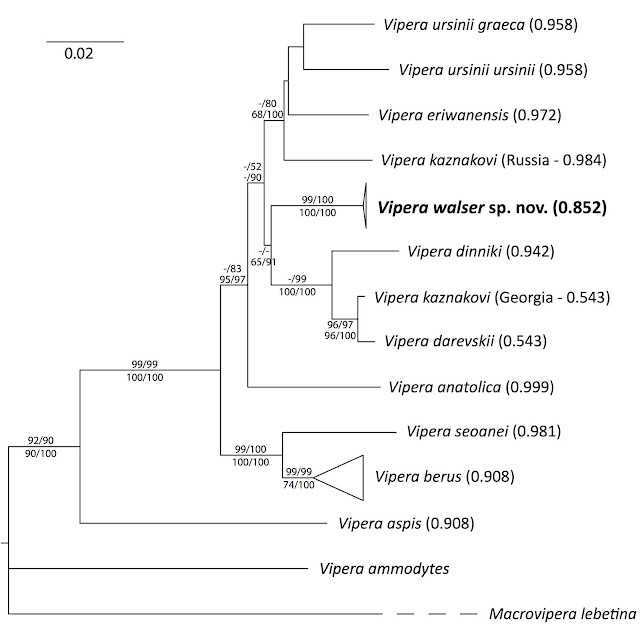 It shows closer affinities to V. darevskii and V. kaznakovi, species occurring in the Caucasus as well as to the widespread Meadow Viper V. ursinii complex. Morphologically, the new species appears to be more similar to V. berus than to its closest relatives occurring in the Caucasus, but can be readily distinguished in most cases by a combination of meristic features such as number of crown, loreal and periocular scales. 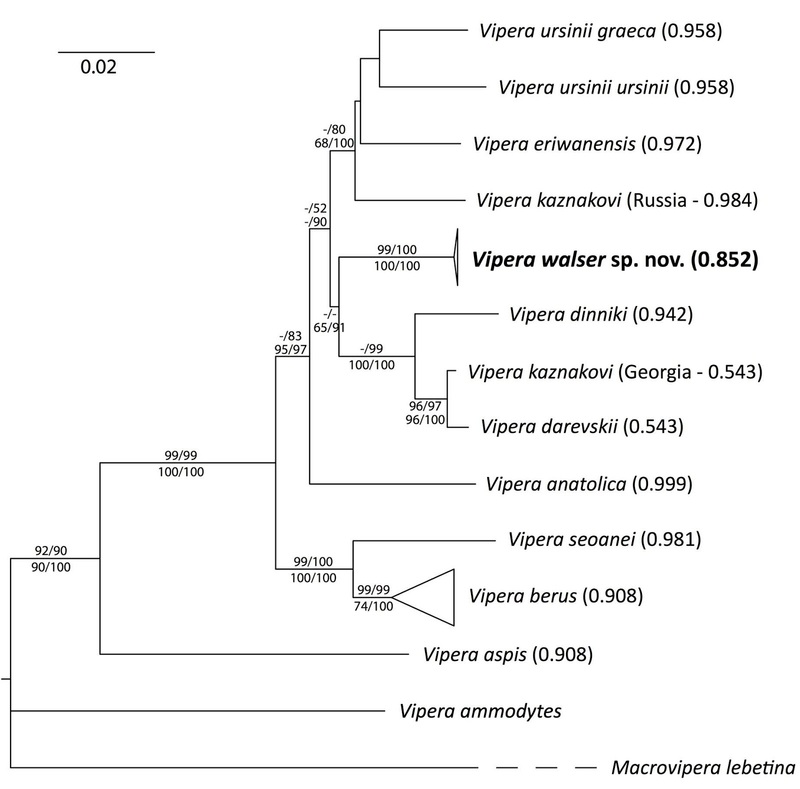 Phylogenetic tree showing position of Vipera walser, and relationships with other Vipera species. My own main interest in the new viper is in its conservation. The species is extremely range-restricted (< 500 sq. km) and occurs only in two disjunct sites within the high rainfall valleys of the Alps north of Biella. We recommend that the new species should be classified as globally ‘Endangered’ due to its small and fragmented range, and an inferred population decline (Red List criteria B1a/B2a). The other species closely related to walser are also either Endangered (V. kaznakovi) or Critically Endangered (V. darevskii) so the entire clade is in serious danger of being lost. The new viper appears to be quite common in suitable habitat within its range. We need detailed studies of the species’ precise habitat requirements, to determine how past and current land use changes have affected the species, and how they might be altered to benefit the species in the near future. The species appears to inhabit open areas, often with rocky outcrops, and may not tolerate woodland unless it is very sparse. European mountains experienced a long period of agropastoral expansion from the Late Middle Ages to the 19th century, with large areas of the Alps converted to pasture and heathlands. These open landscapes were presumably beneficial for V. walser. However, the decline in agropastoral activities in the last 100 years and associated afforestation is probably the biggest threat to the species. Other immediate threats are culling and collection of specimens by enthusiasts. Longer term, the ability of V. walser to withstand or adapt to climatic change expected to take place within its range will be crucial. Its current habitat is restricted to just a few valleys, which experience some of the highest rainfall in the Alps. Climate models indicate that in the next 20 years, these valleys will become far wetter and warmer. Research on how the viper might be able to react to climate change is a priority. Hello, I am a student and currently doing a research questionnaire survey for a (BSc) dissertation project (2016/17) at Reaseheath College, in partnership of Chester University, England. It's focused on British public perception, attitudes and concerns of Britain's Vipera berus. If you choose to participate and/or share with colleagues, your support in filling out this short survey is greatly appreciated in this matter. Please contact me for any further questions. Thanks. We are license to export parrots and eggs to USA, Europe, Asia, United Arab Emirates, Oceania, Middle East. Our parrots are transported in secured cages and live parrots boxes. We also have available fertile parrots eggs for sale. Now available in stock are the following live parrots and birds for sale. We also have chicks from 1 day old up to 60 days old available in stock. Our parrots are free from the bird flu and vet checked. They are tamed and hand raised. They can serve as good pets and companions. All our eggs are collected from very healthy birds in our Aviary , candle tested and 100% confirmed fertile for hatching healthy babies . We are now taking orders from those who are interested in raising up their own baby birds from the eggs stage. Its fun hatching your own baby(ies) from eggs and we will assist you in any way to hatch out your birds successfully. 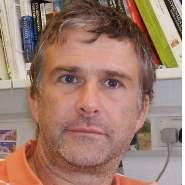 This blog includes posts by members of Stuart Marsden's conservation research group based in the School of Science & the Environment at Manchester Metropolitan University. The group mainly includes PhD students working on the conservation ecology of birds and other wildlife, often in the tropics. We also have posts from other collaborators and alumni. Simon Valle is helping with the blog posts so contact either of us.